Not only do blackcurrants have a unique flavour, but they are much valued for their high vitamin C content. They are used widely in desserts as well as jams and drinks. Blackcurrants, like red and white currants, tend to have a relatively short season compared with other soft fruit, but although related to red currants it is important to realize that they are pruned in a different way. Because the fruit is produced on the previous season’s growth, it is important that this is not removed. Unlike red currants blackcurrants can only he grown on bushes. They are long-lived plants, lasting tip to 15 years or more. 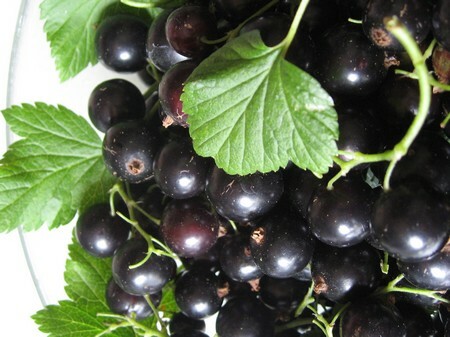 Joostberries, a cross between blackcurrants and gooseberries, are grown in the same way. Blackcurrants prefer a sunny site, although they will tolerate a little light shade. The soil should be well prepared and have plenty of well-rotted humus added to it. Plant between autumn and early spring, setting the plants at intervals of 1,5m/5ft. Mulch in spring with a layer of organic material. Water during dry spells but not when the fruit starts to ripen or it may split. Propagate from hardwood cuttings taken in autumn. Alter planting, reduce all shoots to one bud above the ground. The following winter remove any weak wood. After that remove any weak wood and up to a third of the older wood so that new growth is produced. Never reduce the lengths of the shoots.